March 2019: Promoting low-temperature melting of MOFs with pressure is our latest study on MOFs in the liquid phase… you can read it in Nature Materials! February 2019: Congrats to Romain Gaillac on winning the GFZ award for his PhD work! February 2019: Welcome to Thibaud Dreher and Emmanuel Ren, who are joining the group! 2019: Happy and merry new year! We wish you all the best for the year to come! December 2018: FX Coudert is giving a keynote talk on “Soft Porous Crystals: Extraordinary Responses to Stimulation” at the MOF2018 conference in Auckland (New Zealand). September 2018: Welcome to Wenke Li, joining the group for two years as a PhD student from Wuhan University of Technology! July 2018: FX Coudert is awarded the “International Award for Creative Work” by the Japanese Society of Coordination Chemistry, for his theoretical studies of structures and properties of assembled metal complexes. June 2018: Negative Hydration Expansion, Fabien’s latest paper is out in Phys. Rev. Lett., and it is highlighted as “editor’s choice”. May 2018: The group’s first paper on graphene is out, in Nature Communications! 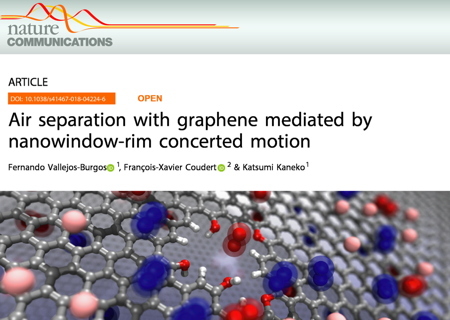 Air separation with “defective” graphene, promoted by nanowindow flexibility, in collaboration with Katsumi Kaneko’s group from Shinshu University in Nagano. April 2018: The group’s first paper on the topic of polymer structure and dynamics at interfaces is out in J. Phys. Chem. B.
February 2018: Our first two papers of the year are out… on Supramolecular Organic Frameworks and coadsorption prediction in flexible porous materials. 2018: Wishing you all a happy and merry new year! May you be blessed with good health, good friends, and good science! December 2017: Guillaume Fraux and Alain Fuchs’ latest review on intrusion of water and aqueous solutions in microporous materials was just published in Chem. Soc. Rev. A nice way to end the year! November 2017: Our work on Liquid MOFs is on the cover of Nature Materials! October 2017: Romain’s latest work on Liquid Metal-Organic Frameworks is now published online in Nature Materials! Part of a terrific collaboration with the group of Tom Bennett in Cambridge. August 2017: After a very nice summer break for all the group’s members, we’re proud to announce our first paper on the topic of machine learning for materials chemistry, courtesy of Jack! Currently in press in Chem. Mater.! June 2017: FX Coudert is one of the 2017 Chem Comm Emerging Investigators! The featured paper is a review of recent advances in computational chemistry of soft porous crystals, co-authored with PhD student Guillaume! April 2017: Chem. Mater. editorial by FX on Reproducible Research in Computational Chemistry of Materials, suggesting some best practices to improve reproducibility in our field of research. March 2017: our work in collaboration with Dani Kohen (Carleton College) using ab initio molecular dynamics to better understand CO2 “trapdoor” adsorption in zeolite Na-RHO is out in Chem. Mater. February 2017: welcome to Laura Scalfi, who joins the group for her Masters’ project. January 2017: a good start to the year, as our perspective on defects, disorder and flexibility in metal–organic frameworks is published in Nature Chemistry’s January issue! December 2016: Jack Evans reveals the microsopic origins of Negative Gas Adsorption in a paper published in Chem! A collaboration with Lydéric Bocquet (Ecole Normale Supérieure, Physics department). Congratulations to Dr. Jean-Mathieu Vanson for a great PhD defense! Very successful collaboration with the Saint-Gobain research center (CREE) in Cavaillon. September 2016: The group’s review on Computational Chemistry for Nanoporous Materials is published in Chem. Mater. June 2016: The DynaMol summer school on molecular dynamics, organised by the group, was a great success. Thanks to all group members who lectured, and to all participants! May 2016: Congrats to Jack on his first paper in the group! Microscopic Mechanism of Chiral Induction in a MOF-5, published in JACS. April 2016: Negative gas adsorption? It sounds impossible, but we observed it in flexible “wonder MOF” DUT-49… and studied it in detail. Read all in this Nature letter, the first paper of an ongoing collaboration with the Kaskel group in Dresden. March 2016: Guillaume Fraux, 1st year PhD student, wins poster prize at French zeolite society (GFZ) meeting. Congrats Guillaume! 29 Feb ’16: Three in a row! 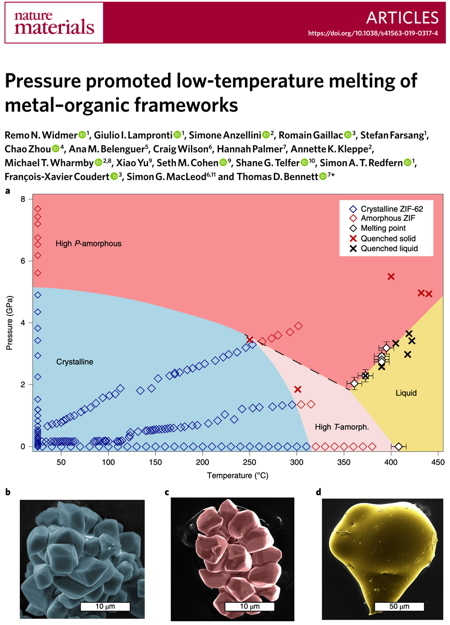 Carbon dioxide solvation in molten carbonates, the results of a collaboration with Rodolphe Vuilleumier are published online in Nature Chemistry. February 2016: “Encoding Complexity within Supramolecular Analogues of Frustrated Magnets”, the result of a collaboration with Andrew Goodwin’s group in Oxford, is published online in Nature Chemistry. January 2016: Our work with Shane Telfer’s group on Controlled Partial Interpenetration in MOFs is published in Nature Chemistry. Great start to the year! Welcome to Jack Evans and Clarisse Péan who are joining the group as postdocs! Welcome to Dani Kohen (from Carleton College) who will be spending a one-year sabbatical in the group! Welcome to Romain, Guillaume, and Elsa who are starting their PhD in the group! 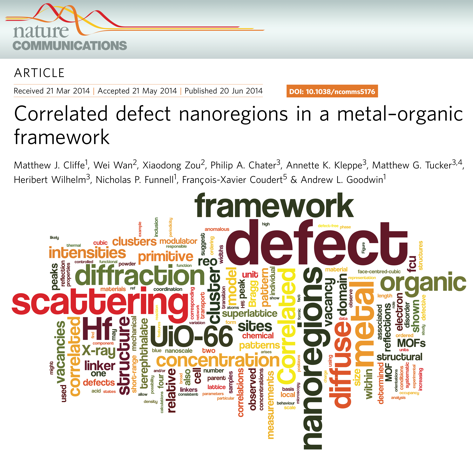 August 2015: Our review on Computational characterization and prediction of metal–organic framework properties appears in Coord. Chem. Rev.! July 2015: Three visitors from down under in a month! Was glad to host Aaron Thornton, Jack Evans and Shane Telfer (chronological order) in our group! June 2015: Organizing and hosting the Workshop on Flexibility and Disorder in MOFs, June 3–5. 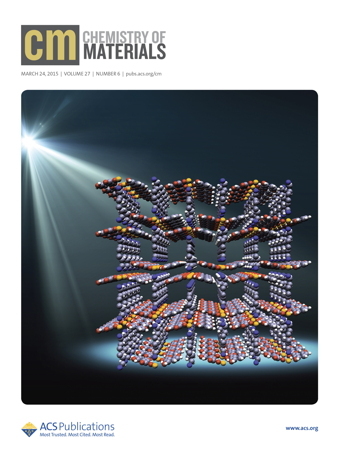 May 2015: Insulator-to-proton-conductor MOF published in JACS! 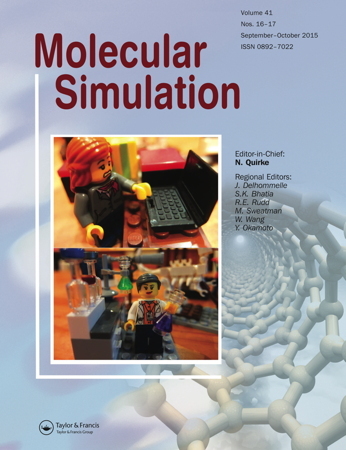 March 2015: We’re on the cover of Chem. Mater. this month! Jan. 2015: Romain obtains competitive PhD fellowship from École Normale Supérieure. He’ll start his PhD with us next term. Oct. 2014: Welcome to Liam, who starts his PhD, and Darrio, who joins as a postdoc. July 2014: Aurélie defends her PhD, and starts work at Saint Gobain Recherche. Congrats! July 2014: Lila and Félix earn their MSc with honors. 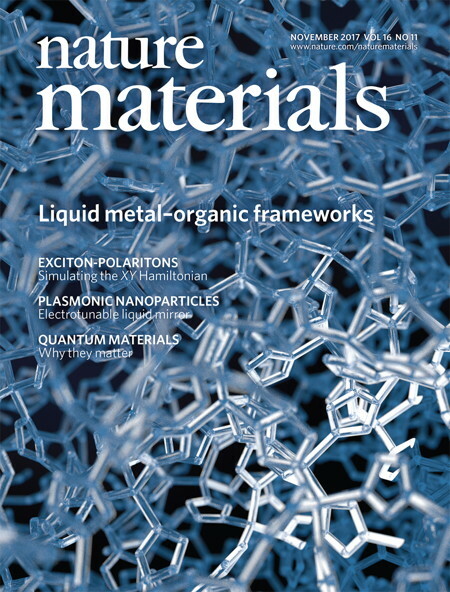 June 2014: In collaboration with the University of Oxford and Stockholm University, we publish in Nature Communications the first demonstration of the possibility of designing MOFs that support correlated disordered states, which has large consequences on the properties of these materials (including mechanical stability and anomalous mechanical properties). Promoting low-temperature melting of MOFs with pressure, our latest work has been published in Nature Materials! Our work on Air separation with “defective” graphene has been published in Nature Communications! Our work on Liquid MOFs is on the cover of Nature Materials’s November 2017 issue! 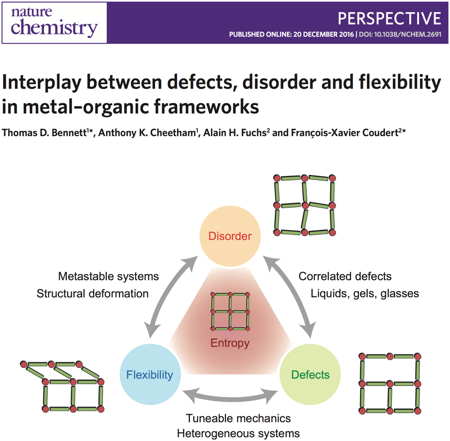 Our perspective on defects, disorder and flexibility in metal-organic frameworks, published in Nature Chemistry’s January 2017 issue! Highly flexible MOF DUT-49 (from the Kaskel group in Dresden) shows negative gas adsorption! Upon adsorption, it contracts abruptly (50% decrease in volume) and expels gas molecules from its pores. Using a combination of in situ characterization and computational techniques, we explain why in our Nature letter. 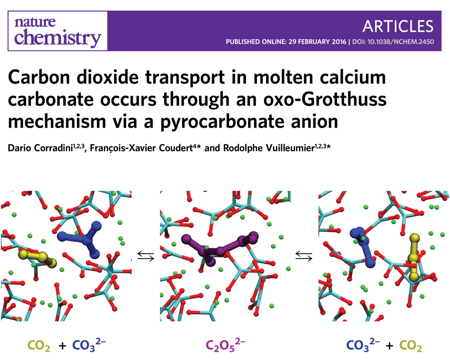 Our work on CO2 solvation in molten carbonates, and formation of the pyrocarbonate anion (C2O52–), published in Nature Chemistry (on February 29th)! Our work on Supramolecular Analogues of Frustrated Magnets, published in Nature Chemistry (February 2016)! 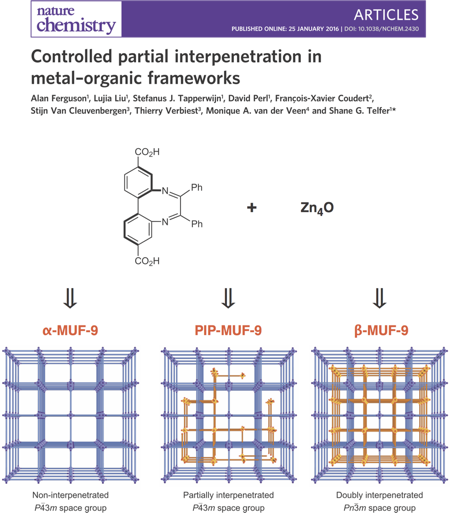 Our work on Controlled Partial Interpenetration in MOFs, published in Nature Chemistry (January 2016)! “Up-and-coming” invited Perspective on Stimuli-Responsive Metal–Organic Frameworks and Framework Materials in Chem. Mater. And the cover of the March 2015 issue!